Idus can be integrated with all types of HMI/SCADA-systems. The integration can be done in two steps. The first step is to an integration to obtain condition based maintenance (CBM), meaning that reoccurring jobs are generated by actual operating data from the HMI/SCADA-system after a predefined interval. In practice, this means that a certain number of operating hours, a temperature or machine cycles are reached Idus will answer by generating a preconfigured work order. We work order can be preconfigured with instructions, material, and necessary documents. We can integrate the systems so that a right click in the HMI/SCADA-system will show Idus commands such as fault report, work order, register a job or log an event etc. Idus can be integrated with every ERP-systems. Idus keeps track of every operational costs but also the equipment value which is beneficial during audits. Idus can for example transfer material costs but also costs of worked hours and storage balances. In practice this means that you don’t need to manually report costs in two separate systems and thus focusing on what is truly important, the daily operation. There are many benefits to obtain by integrating Idus with your OEE-system. Machine operators only have to use their support system and the maintenance department won’t need to manage to systems. A fault report is in the OEE-system can automatically be transferred to Idus where the mechanic after a carried-out measure can correct the fault report with the correct cause, measure and then report back necessary information so that the fault can be avoided. The fault causes can then be analyzed so that necessary conclusions can be drawn from the information in the maintenance system. Idus can also collect actual operating data from the OEE-system and allowing these values to trigger preconfigured work orders with instructions, material and necessary documents. Why guessing when maintenance can be based on actual condition and in that way gaining better overall equipment effectiveness. Planning and scheduling preventive maintenance measures often need to be planned together with the production department. 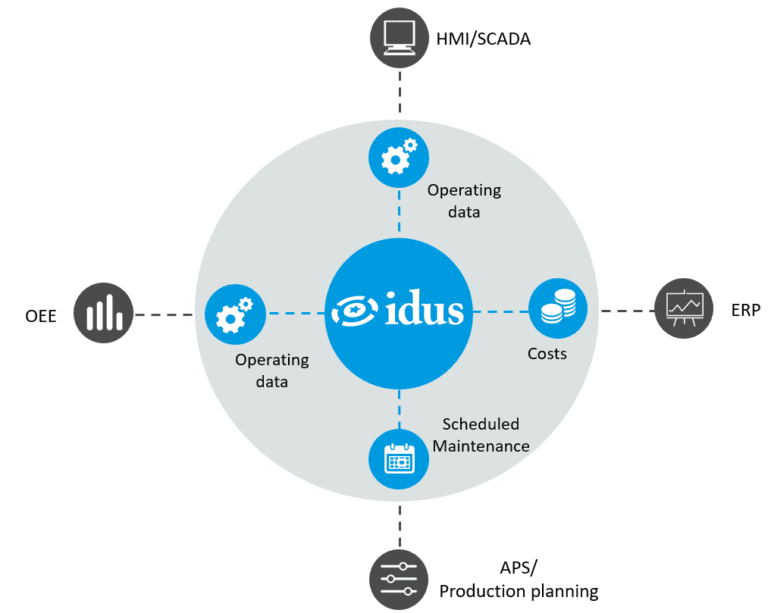 By integrating Idus with your APS/Production planning-system you can visually and easily plan your maintenance activities during the windows which are optimal for the production department. Below you will find some of the systems that Idus can be Integrated with. If you wish to integrate Idus with a system that is not displayed below; please contact us here.